Join Our Next Beginners Class! Welcome to the Kettlebells Niagara website! We are excited that you are returning or investigating how Kettlebells can fit into your physical training program. Owner and Operator, Tina Boccabella leads you through a planned training circuit in the classroom setting that works towards meeting your goals for physical strength, toning and weight. Her experience and training as a Certified Personal Trainer and as a Nutrition Wellness Specialist provide you with a well balanced guide as Tina designs circuits and programs that are best suited for your physical training needs. You haven’t heard of Kettlebells? 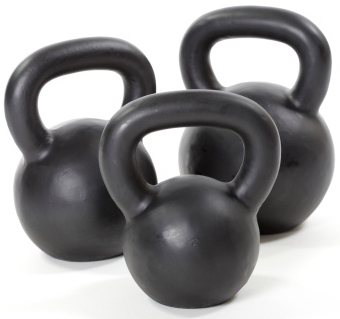 Did a friend share their experience with you about the amazing workout kettlebells provide for your body? Kettlebells first appeared in Russia as far back as the 1700’s when they were used as counter weights for weighing crops. Farmers using these weights began to realize their strength building abilities and it’s popularity even spread to the Russian Army for physical training and building strength. Kettlebells’ effectiveness for strength training is attributed to its ballistic nature of exercise that engages the body in a combination of cardiovascular, strength and flexibility training. Here your muscles have the most significant potential for growth and strength. Ballistic training causes the muscles to adapt to contracting very quickly and forcefully and the central nervous system to coordinate and deliver the greatest amount of force in the shortest time possible. The kettlebell’s center of mass is extended beyond the hand and is used in swing and release movements that enable safety of grip, while increasing wrist, arm and core strength. Kettlebell workouts involve compound exercises which develop incredible strength, endurance, and flexibility throughout the entire body. Under the guidance of a Certified Training Professional, such as Tina Boccabella, kettlebells offer improved mobility, range of motion and increased strength. If you are interested in beginning your journey to greater strength, coordination and health, join a Kettlebells Niagara class today. Please feel free to contact us to find out when the next beginners classes will be held.